Sure they both offer fantastic performance and durability, but neither come up short in the ‘bling-factor’ category either. If they do their job well, you don’t notice them, but they deserve your love and attention. They’re arguably the most important point of contact on your bike (sorry grips, sit down seat) but they’re often where we save a few bucks by not getting the good stuff, and it’s even easier to scrimp out when it’s for a kid’s bike, but is that a good idea? Splurge for the good stuff that should work better for longer, but that can sting your wallet as much as your shin. If you value good pedal performance enough to make up for the premium price that’s a personal decision. But what about the groms, who don’t yet have the experience to make the comparison likely even the ability to articulate the nuances of their opinions? Is it worth getting ‘the good stuff’ for kid’s bikes? 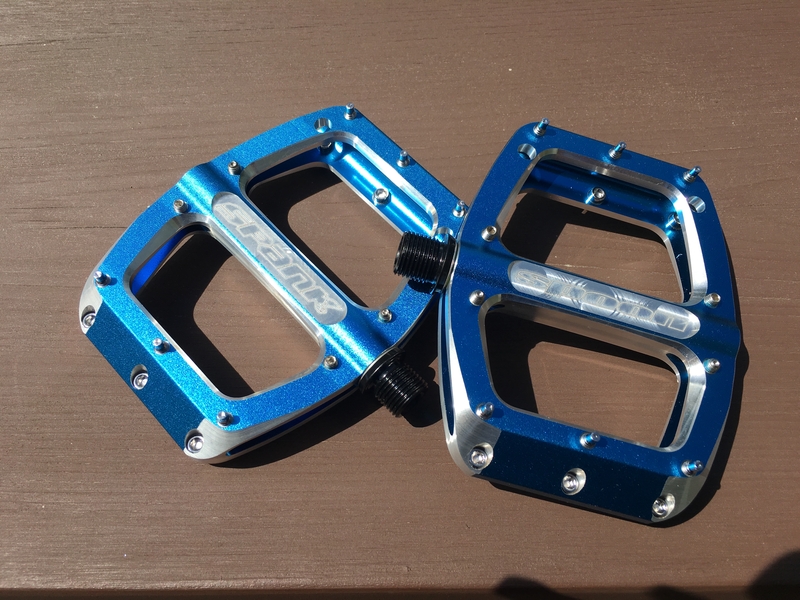 These pedals come stock on a not-cheap bike from a major bike company. They were used in a pinch for about a week. Notice how many plastic ‘pins’ were totally ground down to flat. Groms are hard on pedals and cheap ones just can’t cut it. Now, we’re not talking the kind of kid’s bikes you get from your local big-box store, branded with the latest star wars, Marvel, or Pokemon characters, we’re talking about the latest generation of performance bikes that now come in smaller sizes. The bikes that can handle laps in the bike park or tagging along with parents as they hit their regular trails. Sadly, most of the new generation of full suspension kid’s performance mountain bikes come with terrible pedals. 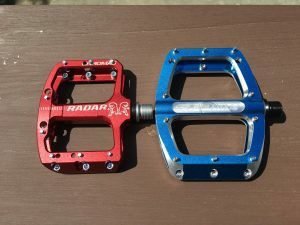 However, some manufacturers have stepped up and now offer small-platform versions of their adult high-end pedals and we got our hands on two sets of the best pedals available to the smaller footed crew, the Chromag Radar and the Spank Spoon 90 and put them to the test for an entire season. So how did these pedals stack up? The short answer is that they were a-w-e-s-o-m-e. Seriously, upgrading pedals is one of the easiest things you can do to a grom’s bike and has an immediate impact of their confidence and riding. Spoon 90 from Spank in cool blue. 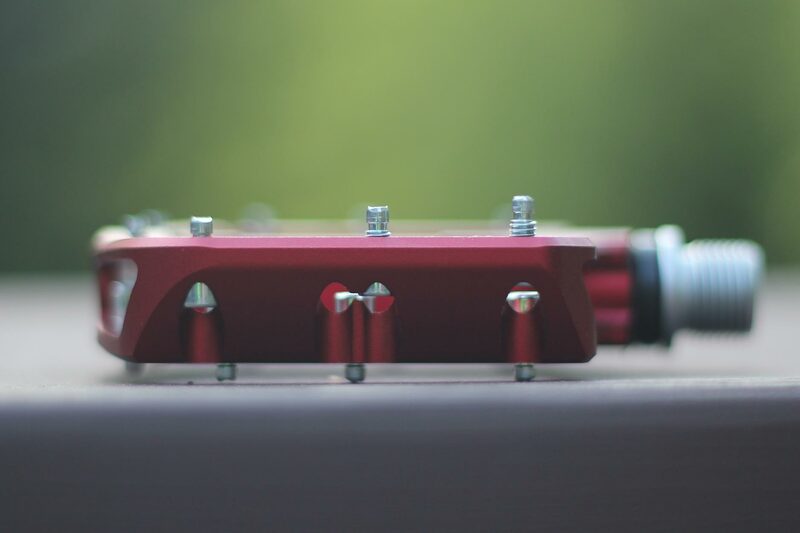 While many manufacturers offer different pedals with different platforms, Spank offers it’s highly regarded ‘Spoon’ series pedal in three sizes. The smallest of these, the ‘Spoon 90’ is perfect for the grom who rides bigger than their stature. As another heavy hitter in the pedal game, Chromag’s entry into the pint-size pedal game is no slouch either. Using what they’ve learned over the years with the Contact and Scarab pedals, Chromag set out to create a pedal with the same performance but in a much smaller package. The testers themselves are from Whistler and North Vancouver, with different ability levels and range from 7-12 years old. In order to properly assess the impact premium pedals would have on a rider, we assembled a crew of testers who could really put them through their paces. 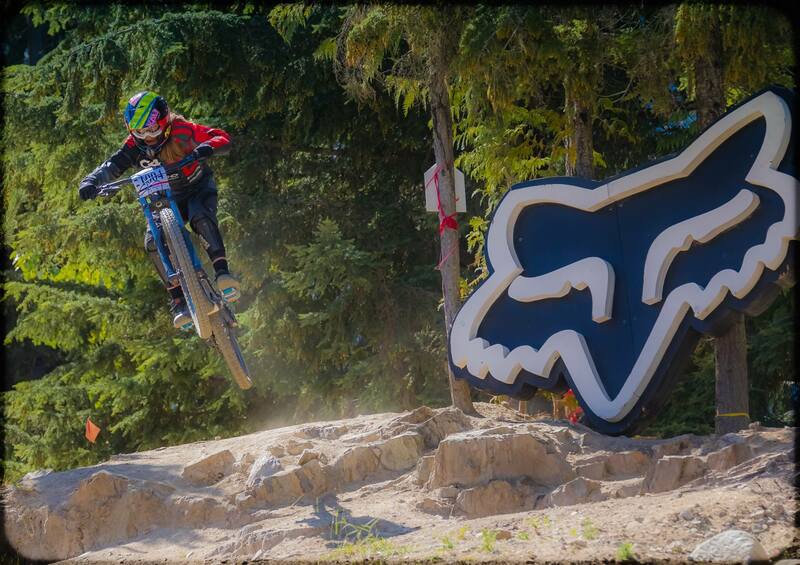 While testing the pedals our testers competed in more than 20 races (Some enduro and XC, but mostly DH), have reached a handful of podiums, and spent at least 150 days in the bike park. Our team of groms rode these pedals HARD. 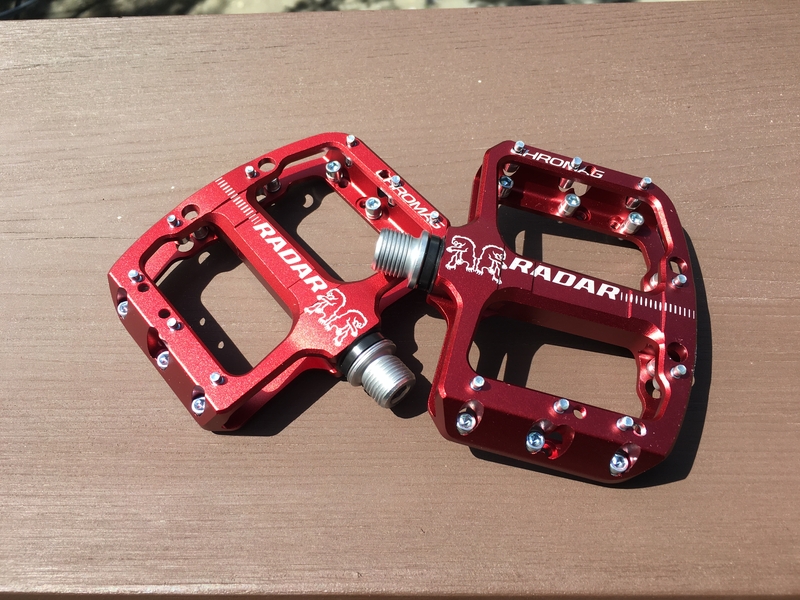 These pedals aren’t only appropriate for racers and park-rats, but testing with these young bike fiends has let us squeeze in about 5 year of normal use in just one season. Proper sizing of a flat pedal is a point of great debate. Some like a large platform, other want just enough room to be able to turn the cranks but no more so as not to clip the roots and rocks. But everyone will agree, small feet are no match for full-sized pedals. Side-by-side comparison of the platform size. Size 5 shoe. In this showdown it’s the Spoon 90s that are large of the two. Both offer a low profile but the Spoon 90 is just a hair thinner. So which comes out on top? Well that’s completely up to the size of the foot they’ll be supporting. Larger groms will appreciate the bigger platform of the Spoon 90s, but that same sizing might be a bit too much for kids on smaller 20” and 24” bikes. Winner – Shoes size 5 and higher: Spoon 90s Size 5 and smaller: Radars. It should be noted that while the Chomag Radars might be more appropriate for smaller feet, a trailside non-scientific experiment showed that the relative size of size 5 shoes on Radar pedals was roughly the same as this writer’s size 13 shoes on the Chromag Contact pedals, so even the smaller Radars will last a growth spurt or two. Excellent use of lines and negative space on the Spoon 90s. This is purely subjective. 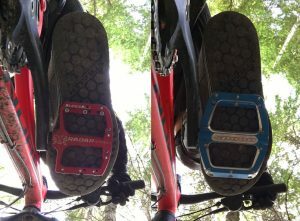 Both of the pedals have looks based on their larger siblings and come in different colours. The Spoon 90s come in 4 colours and the Radars offer 5 different colours. Both offer red, black and blue, but if you’re looking for orange, green or purple, your brand decision will be made for you. Winner – I’m going to give this one to the Spoon 90s, I just love the angles, but that’s just me. Both feature a chromoly axle, replaceable bearings and a concave profile (the Spoon 90s are slightly more concave). Due to their larger size, the Spoon 90s also come with a 60gram weight penalty. The biggest difference comes down to the pins. While the Spoon 90 is no slouch with 20 pins per pedal, they don’t come assembled. Not a huge deal, but prepare yourself to spend a fair bit of time with a tiny allen key and tired wrist before the pedals are ready to go. On the other side of things, the Radars come pre-assembled. But that’s not where it ends. They come with 16 pins pre-installed per pedal but can handle up to 22 pins depending on your grom’s preference for grip and position. Speaking of grip, the difference in grip that both of these pedals offer when compared to generic/OEM pedals can’t be understated. In fact, our younger testers found the pedals TOO grippy. This is likely due to the fact that it’s a big step to go from regular to performance pedals. One feature offered on the Chromag Radars really stood out here: The Radars come with spacers on each pin, the depth of these spacers is close equal to the length of the pin beyond an engineered shear point, or a place where the pin is meant to break when under stress. 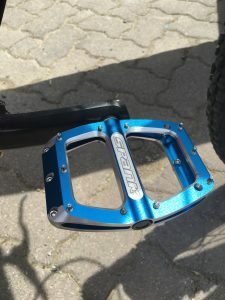 In the adult line of Chromag pedals, this ingenious little feature lets users with an allen key simply remove the spacer on a pin to have it back to regular length, an operation that can easily be performed trailside. The three pin height option is both a great way to get your grom used to riding with grippy pedals, and highly useful for fixing the pins trailside. For the pint-sized rider, these spacers add the extra advantage of letting users run much shorter than normal pins by using two spacers per pin. The photo below shows the variety of pin lengths that can be used on the Radars. We ended up using the shorter pin options for our smaller testers and they found it to be a great feature, especially when taking the big step up from OEM pedals. Winner – Chromag’s adjustable height pins may be a minor nice-to-have feature on full-size pedals, but absolutely genius for smaller riders. Radars win this round. Groms are rough on equipment, and just by the fact that they’re closer to the ground, they’re particularly hard on pedals. So how well did the test pedals hold up? Flawlessly. 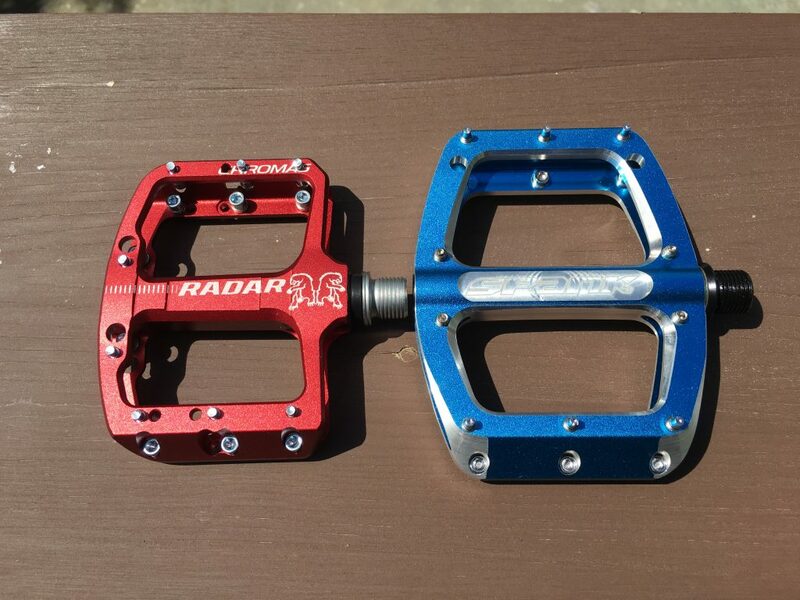 Seriously, both the Radars and Spoon 90s were used and abused up to and beyond any adult level. They were run into roots, clipped against rocks, rubbed against pavement and much more, but both sets came out the other side relatively unscathed and even looking pretty good (once any damaged pins were replaced of course). Winner: Both pedals were still in spectacular shape after a full season, and we’ve seen a lot of well used Radars still in great condition, but the Spoon 90s are spec’d on Whistler Bike Park’s 2017 grom rental fleet, so we’ve seen a lot more in great condition after being abused by beginners. Both pedals offer outstanding durability, but I’m giving the win to the Spoon 90s based on the size of the data-set. SO WHAT PEDAL WAS THE EVENTUAL WINNER? That’s going to depend on your grom’s shoe size. If they’re rocking size 3 shoes or smaller, then the Cromag Radars are the bomb. If they’re feet are size 6 or bigger, the Spoon 90s (or their larger siblings the Spoon 100s) are definitely the way to go. As for the mid-area, size 3.5 to 5.5, it’s a bit of a toss up. On one side the larger Spoon 90s will take longer to grow out of, but on the other hand the variable pin height option with the Radars is fantastic for riders just stepping into (onto?) high end pedals. I’ll give that one to the Chromag Radars by a hair. BUT IS IT WORTH GETTING PREMIUM PEDALS FOR SMALL RIDERS? That’s a totally valid question. Biking is a very expensive activity, which is only made more expensive when you’re trying to outfit someone who grows out of their bike every 2 years. A bike park worthy full suspension kid’s bike starts around $2k so it’s tempting to look for ways to keep the costs down. So do good pedals merit the extra $120ish dollars you’ll have to lay out? No Question, an emphatic ~yes~. 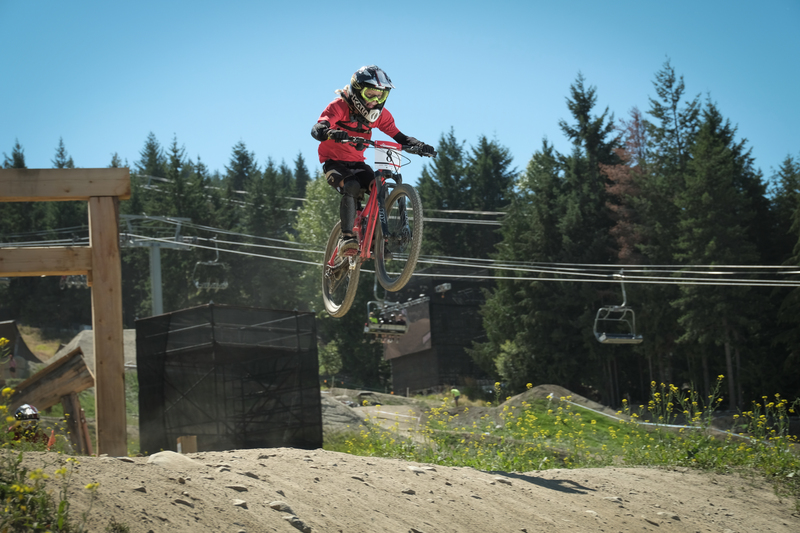 Watch a kid ride on some technical terrain that’s right at the edge of their ability and you’ll notice that they struggle a bit more to keep their feet on the pedals properly than adult riders. This is probably because they don’t have the upper body strength and put more weight on their feet to compensate. Not to mention the fact that their light frames are easier to buck off the bike. When we introduced the new pedals to our two smallest testers, there was an almost immediate improvement in their riding, I’m sure that some of that had to do with the performance of the pedals, but that increase in performance also lead to a massive increase in their confidence. They began to trust that their feet would stay where they wanted them to. There’s also the the safety factor to consider. If you’ve read this far, we’ll assume that you’re either a parent or someone who rides with kids a fair amount. Just think about how many of their bails have stemmed from feet coming off pedals (if you haven’t ridden with groms much, rest assure that it’s a heckuva lot). A good set of pedals isn’t going to completely eliminate the issue, but it is going to make it a less common occurrence, which can only lead to fewer ejections. 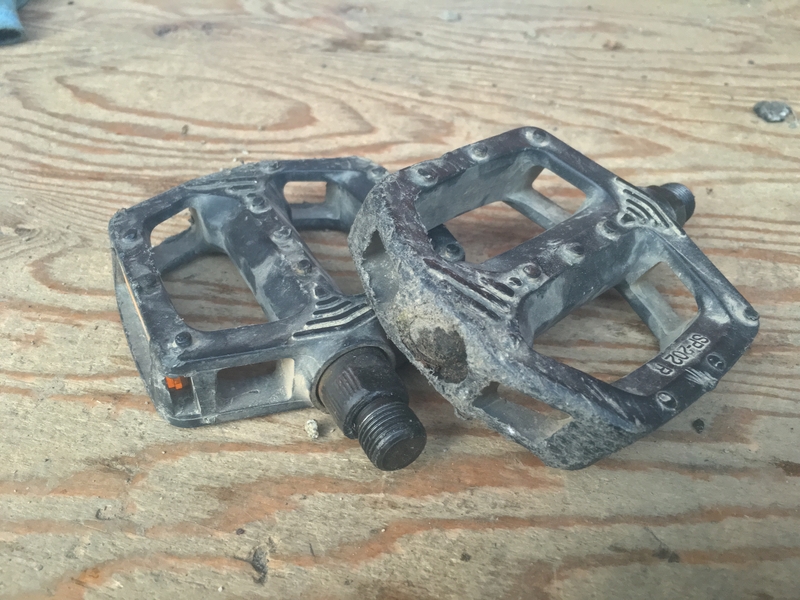 $120 is a small price to pay for that kind of immediate confidence, and if the premium pedals lead to just one less bail, they’re more than worth it.